CNDLS would like to congratulate Georgetown professor Anne Rosenwald (Biology) for a recent recognition she received for her dedication to teaching. In September 2013, the American Society for Microbiology (ASM) selected Rosenwald as one of nineteen biologists nationwide to participate in a one-year residency supported by the National Science Foundation (NSF). During her year in the ASM-NSF Biology Scholars Program Assessment Residency, Rosenwald will focus on how to improve undergraduate biology education. Dr. Rosenwald is already familiar with this mission, as evidenced by her work with the Genome Consortium for Active Teaching (GCAT) and the Genome Education Partnership (GEP). Moreover, her work has been featured on the CNDLS Teaching Commons as a model for teaching and learning; Dr. Rosenwald successfully brings cutting-edge research techniques to undergraduates and fosters the development of her students’ communication skills. By engaging her students in a process of scientific learning that is both skills- and content-based, Dr. Rosenwald provides them with an enduring foundation in the sciences that is useful whether they pursue careers in the field or not. Dr. Rosenwald views the residency as an opportunity to reflect on and refine her pedagogical approach; she is confident the program will assist her in enhancing classroom assessment tools and measurable learning outcomes. In addition to attending an intensive Measuring Student Learning Institute in DC, she will have her own teacher—a mentor who was a former participant in the program. 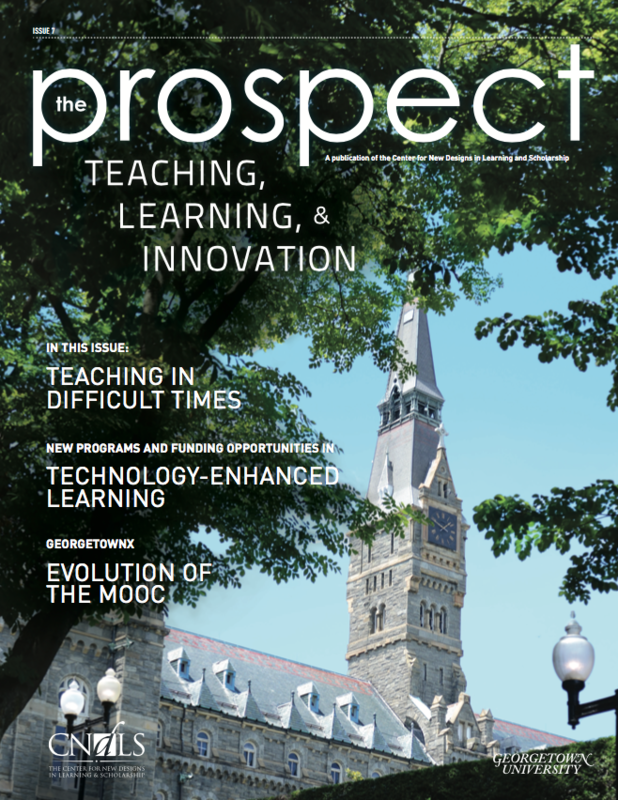 Together, the experiences of the coming year will have a positive trickle-down effect for student learning on campus, for Dr. Rosenwald is an involved faculty member and integral part of Georgetown. In addition to her role as a professor in the Biology Department, Dr. Rosenwald is Co-Director for Georgetown University’s Biology of Global Health major, an adjunct assistant professor at the Lombardi Comprehensive Cancer Center, and an avid researcher of cell biology. Once again, CNDLS wishes to congratulate Dr. Rosenwald on her residency, her exemplary teaching, and her service to her students and the larger community of Georgetown. Posted October 15, 2013 by Caitlin O'Leary & filed under New Features.